Shizuoka Prefecture, home to the iconic Mount Fuji, is located between Tokyo and Osaka and has easy access to both cities. The mountainous landscape offers plenty of opportunities for biking and hiking excursions, while its towns and cities provide a wide variety of sightseeing attractions and many historical places of interest to visit. The prefecture’s largest city Hamamatsu is home to the Act City Tower Observatory, the apex of which provides stunning views over the city and beyond. There are many colourful festivals taking place in the city throughout the year, including the Hamamatsu Kite Festival in early May. Shizuoka prefecture produces almost half of Japan’s green tea and is regarded as a mecca for tea lovers from all over the world. The World Tea Museum, located in the well-known tea-growing area of Makinohara, offers visitors the opportunity to learn about the history of tea making in Japan and participate in traditional tea ceremonies. 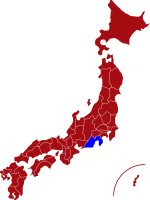 For more information about Shizuoka prefecture, see their official tourism website. Air - Shizuoka Airport, also known as Mt. Fuji Shizuoka Airport, operates domestic flights to and from Sapporo, Fukuoka, Kumamoto, Kagoshima and Naha (Okinawa). Click here for its English website. Rail - The Tokaido Shinkansen bullet train links Shizuoka with Japan’s major cities, including Tokyo, Osaka, and Nagoya. Journey time from Tokyo is just over one hour. 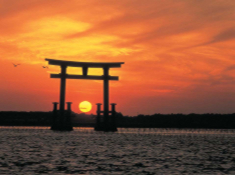 Bentenjima is a popular tourist destination noted for its stunning sunset and many traditional hot spring resorts. 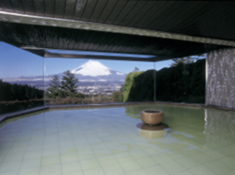 Gotemba Onsen has many wonderful outdoor hot spring resorts with spectacular views of the iconic Mt. Fuji. Mt. 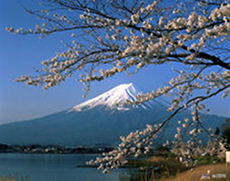 Fuji and Cherry Blossoms - Two of the most popular tourist attractions for visitors to Japan. 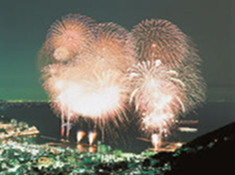 Atami Water Fireworks Display - Visitors can enjoy spectacular firework displays from the waterfront on certain days of the month between April and December.